Today, Tuesday, December 5, 2017, Safe Passage Project and our cooperating attorney Paige Austin from the NYCLU successfully defended a teenager who had been detained by the federal government for more than five months as part of his immigration proceedings. “This young man was cooperating with immigration authorities and pursuing legal status in the United States when he was swept up in re-arrests by DHS in the summer of 2017,” said Tim Greenberg, who is one of the teen’s lawyers and is one of our staff attorneys. Safe Passage Project first fought for this young man’s return to New York State after the government wrongfully moved him to a remote detention center in California. Our cooperating attorneys at the Northern California chapter of the ACLU successfully won a federal court order and class certification (Saravia v. Sessions) holding that DHS must justify why it rearrested and detained youth based on gang membership allegations that did not stand up under scrutiny. Under that federal court order and the Flores judicial orders, children should not be detained without an opportunity to contest the circumstances of their re-arrest and detention. We expect the government to reunite our client with his mother and family within the next day. Pictured below are the family and some of the members of his legal team. We are grateful to everyone who has assisted in this landmark case and believe that at least 13 other young people have been released after wrongful re-arrest. Children are children first. Immigration law should not change the fundamental protection of the best interests of children. 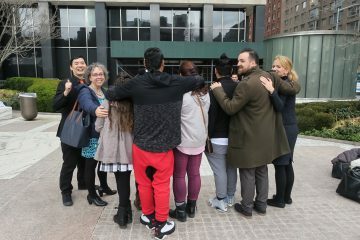 Safe Passage Project, housed at New York Law School, is a nonprofit organization dedicated to recruiting, training, and mentoring attorneys who provide free legal assistance for children in immigration proceedings. Safe Passage thanks Stephanie Gibbs, Rex Chen, Lenni Benson, and Desireé Hernández, who provided invaluable help to the case.